City and Chamber officials on Thursday hosted a ribbon cutting to welcome a new addition to The BLVD – Maribel’s Cafe and Bakery. LANCASTER — The city of Lancaster and the Lancaster Chamber of Commerce on Thursday welcomed Maribel’s Café and Bakery to The BLVD. Maribel’s Bakery is the third recipient of the City of Lancaster’s Spice Up Lancaster Loan Program; receiving a loan for $25,000 to fund construction of a patio dining area for the new location, as well as to purchase signage and kitchen equipment. 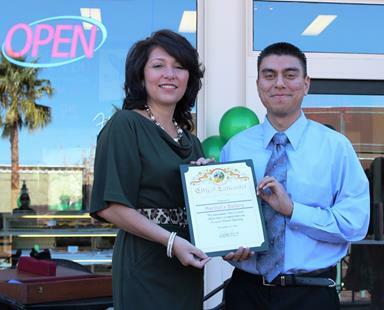 The new downtown Lancaster location is owned by Maribel’s son, Nick Parada (right), shown with Lancaster City Councilmember Sandra Johnson. Established by Maribel Parada, Maribel’s first opened in Lancaster in 1993 on 20th Street West, between Avenue J and J-8. Now the Parada family has added a second location, in downtown Lancaster, founded and owned by Maribel’s son, Nick Parada, and his wife Jessica. The new bakery is a modern version of the original location with its hand drawn menus, coffee tables, and outdoor patio area. Initially, Maribel’s sold cakes, pan dulce, tacos, and burritos. They later added pupusas, which became a favorite among many customers. Since then Maribel’s has carried a variety of gourmet pupusa fillings. In addition to the customary cheese filling, customers can enjoy pupusas filled with cheese and fish, bacon, ground beef, spinach, olives, and mushrooms. Maribel’s also offers tamales, empanadas, and breakfast burritos. Throughout the years, Maribel’s has become well known for their custom cakes, pastries, and freshly made baked goods. Maribel’s sells muffins, scones, fruit tarts, cheesecake, cookies, strudels, turnovers and Danishes. In addition, Maribel’s features an exhibition table that allows customers to watch the baker prepare pastries. 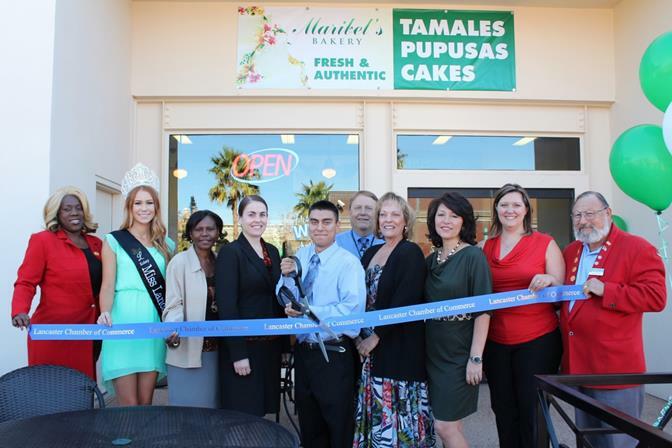 The new Maribel’s Café and Bakery is located at 706 W. Lancaster Blvd. Suite 101, next to BeX Grill. For more information, call 661-942-1611 or visit www.maribelsbakery.com. The Spice Up Lancaster Loan Program offers low-interest loans of up to $25,000 to facilitate expansion to another location for well-established restaurants that have been operating in the Antelope Valley for 10 years or more. Restaurants must have fewer than five existing locations in order to be eligible. There is currently one remaining loan left in the program. For more information, contact Management Analyst Chenin Dow at 661-723-6165 or email cdow@cityoflancasterca.org. 17 comments for "Maribel’s Cafe and Bakery comes to The BLVD"
Congratulations! Let’s see how many business haters (Democrats) root for this business to fail. At the rate that the Democrats running California is going, we will be left with only fast food and service sector jobs. You’re full of it, Richard. Are people protesting outside BLVD businesses carrying signs that causes them to fail? How about the BLVD was poorly thought out and/or Rex has caused residents of neighboring cities to stay away? There are small businesses all over the Valley that are still around, so how come they can’t make in on the ‘world class, safest place in the universe’ called the BLVD? Those are Rex’s words, not mine. Some new places on the BLVD barely lasted 6 months. They would have been smarter to open in one of the many shopping centers around Lancaster instead. There are a bunch of small businesses/restaurants around the Von’s in the Rancho Vista shopping center that have been there for a long time, for example. It’s called ‘synergy’. There is no synergy on the BLVD unless there’s an event and then it disappears. Nope. The problem IS Rex Parris and once you get that, you might want to do something about it. Calling people ‘haters’ will surely not make them come to your BLVD. Did you really think that would do it? Richard, when was the last time, if ever, that you went to the museum or bought stuff at the shop in the theater or even saw a movie in the theater. Or do you just hang out at the beer joints? Can you quit being a bitter old queen for once and start doing positive things about our communities for a change, Bill? I am waiting for you to make some off-base remark here about a small business in Lancaster and them taking you to court and suing you for every last penny! Is that you, Adam Chant? I just read Adam Chant say something similar to David Grajeda on the AVLTE site about him saying ‘slanderous’ things about a particular business on the BLVD. However, the written word isn’t ‘slander’. It’s called ‘libel’. But, Adam knows everything. What? Are Palmdale and Quartz Hill residents supposed to sit by quietly while Rex stomps around the Valley like a drunken Godzilla suing his neighbors and building a Walmart across from QH High School. There’s nothing in my comment that I could be sued for. And, you’re not helping Lancaster with your comments. But, I love the ‘sue mentality’ you have, just like Rex. I’m not Adam nor Rex. Neither of them would bother to waste any time on you, which is better for them. Today is my first day coming on here to address you. I have been sitting on the sidelines for a long time watching you make hateful and catty remarks about people and businesses. I know who you are. You make the same snarky and hateful comments on facebook that you do on here. At this point, it’s just a matter of time until you get yourself in a major pickle and end up in court. I don’t have a “sue mentality”. That’s something you Democrats OWN, not me! What I do have is an accountability mentality and I believe in holding people liable for what they say when it has an effect on the livelihood of other people. I suggest you choose to word your online statements better before they get you into a pile of trouble that you may not easily get out of. what do think this is, a lancaster council meeting? free speech is allowed here. william can voice his opinion about the blvd and any business on it. ever hear of yelp? people post good and bad reviews all the time. some reviews are brutal. grow a thicker skin. if you can’t take what is on a blog that is pretty sad. That’s weird. The comment on the AVLTE Facebook page by Adam Chant has disappeared as well as all his other comments on that thread. Look for yourself. There are replies by David Grajeda to Chant but all his comments and replies are gone. Also, Anti-William. As flattered as I am that you are anti-Me, (I must be doing something right) your initial reply to me was hateful then you reply again accusing me of hateful comments. That’s called ‘hypocrsy’. Do you understand that? But, I forgive you. Of course you want to defend Lancaster against all enemies, foreign and domestic, ss I want to do for my city, Palmdale. And, you must know that Rex Parris has been an outright enemy of Palmdale and its leaders for years and has demonstrated that by his actions and words. So, if I can keep pointing out what he has done so that it serves to awaken Lancaster voters to do something about it, I’ll keep at it. I haven’t singled out any particular BLVD business with hateful comments other than making observations of the fact that on most days, most of the places are nearly empty at lunchtime or the traffic flow and parking is a pain and comments such as that. I get that you don’t like it. I have gone on to suggest that Rex’s actions have caused ill will with his neighbors while the BLVD struggles with its problems and failed businesses. Is that not true? As for my mocking, that’s the fun part. Hello Lancaster Blvd. haters.I like to go there, if u don’t, don’t. Stop rooting for small business to fail. Go ask Maria Elena at lemon leaf if she gets free $$ and check out the huge about work they do. Question? Does anyone have a clue why some businesses have already closed on the BLVD. Barone’s was a well-established business but their new restaurant on the BLVD didn’t last a year. Same with Brittany’s before it. Yet, there are many small restaurants and other small businesses that have lasted decades around the Antelope Valley, some in not very fancy locations. But, they are still there. There are 3 small restaurants on Q-6 in Palmdale, side-by-side, that are still there and that isn’t a prime location such as the fabulous BLVD. So, why do new places fail on the BLVD? Is it because they don’t know how to run a business or because the BLVD just isn’t what it’s cracked up to be. Adam Chant, astute supporter of small business, should know the answer to this question. Is it poor business acumen on the part of the owners or is it the BLVD itself? @William, u went their & wrecked business. That’s rich, red. You’re the one who goes there and ruins businesses. Not me as I no longer go there. You must be like a skunk at a picnic. I’m very happy to hear that this bakery hit the charts. They did our wedding cake in April 2013 and it was delicious! I’m so happy for Maribel’s Bakery!!! My mom has worked hear for years (and she speaks English just fine) with the family and they are all wonderful people!!!! I’m so excited to come see the new establishment. Congrats! I want to Congratulate Maribel and her family for expanding their success in the AV. I have been buying birthday cakes and meals from this place for many years now and can honestly say that i have never encountered an issue. The personnel there has always been courteous, something that my family and i love when looking for a great bakery to purchase our family cakes from. The “experience” is nothing but a facade. Anything past the boulevard is reality. @10dog You say free money ?? Now the traffic, I’ll give you that…that whole Blvd. strip is just a 9 line bind.